*Disclosure: I received complimentary passes to Legoland. This is not a paid post. All opinions expressed are my own. Over time celebrating my son's birthday has turned into an annual tradition to take a road trip to an amusement park. 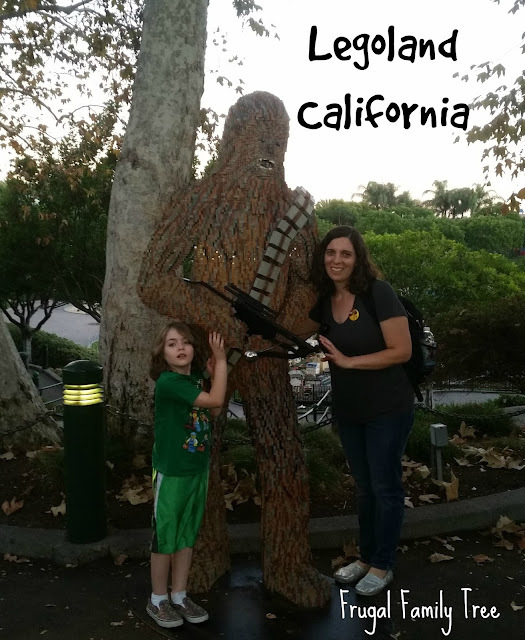 To celebrate my son's 7th birthday we decided to plan a trip to Legoland CA. 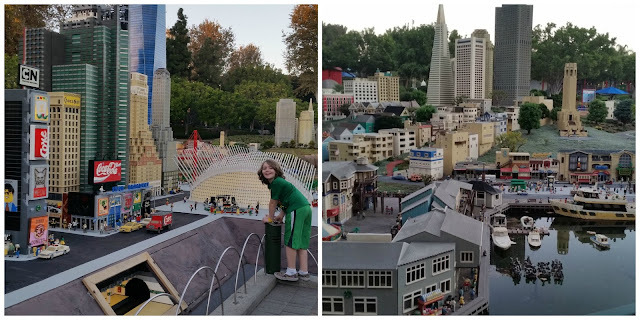 Legoland has only recently come onto my radar of cool places to go since at 5 my son started to have interest in Legos. My son and husband now play a Lego video game called Dimensions and it has been the cutest thing ever to see them both get into a video game so much. They build stuff together, they play games, they watch the movie all the time and we knew Legoland would be a perfect place to celebrate his birthday. 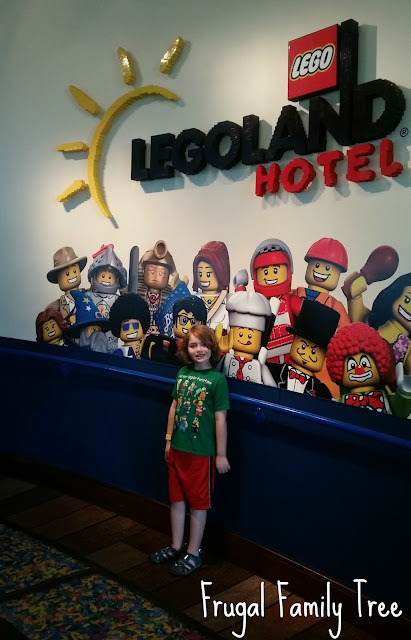 As we began to plan our trip I would ask other parents if they had been to Legoland and did they have any tips or advise on planning a trip there. Most parents that had been said they loved it and would ask how old my son was. I realized after going most people asked how old he was since it is a park geared at younger kids. The park is awesome! Everything was made out of Legos, the rides had Lego themes, the decor was Legos too. Everything from Ninjago, Nexo Knights, Chima, Lego City and our favorite Star Wars, was there. 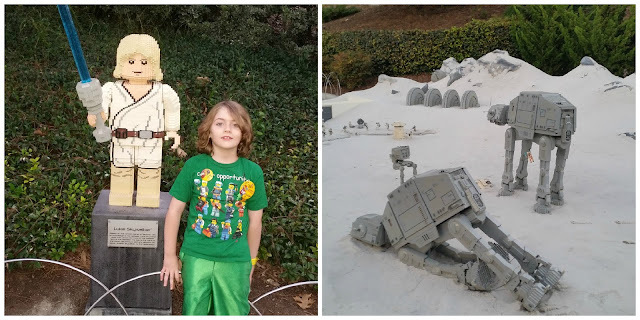 As huge Star Wars fans we were thrilled with all the cool displays in Lego Miniland. I was really Wowed by this place. I had no expectation for it since no one I know closely has been there. We did not watch any videos of the park as to not spoil the surprise of what would be there. I did however download the Legoland app. It helped tremendously for showtimes, food choices and the best part, coupons for savings on merchandise. I loved that the majority of the rides were family friendly. We love going on rides together, my son can be a little apprehensive of rides when we first arrive at a park so being able to go on as a family warmed him up to going on the kid only rides. We definitely have our favorite rides. 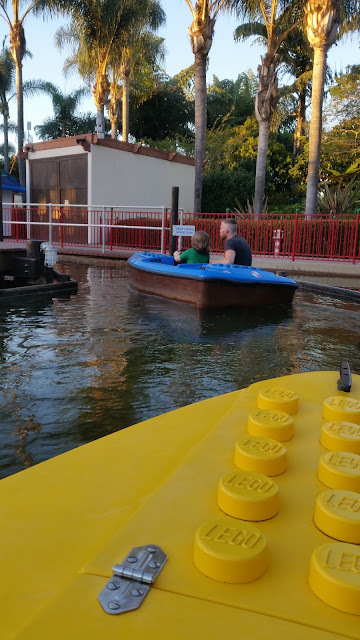 My favorite ride is Skipper School were you get to drive a Lego boat through twists and turns in the water, there are no tracks so I was able to speed by my husband and son in their boat. My son's favorite is Driving School, where he drove a mini Lego car through a Lego town, he rode it a few times. My husband loved the Pirate theme area and Captain Cranky's Challenge was his favorite. It is a big pirate ship that is on a U-shaped track that makes you feel like your in the sea swaying in the waves. Police and Fire Academy ride was a family favorite of ours. Its super interactive as you have to push up and down on a handle as a group to get your car going, then jump out of the ride when you reach the town "on fire" using a water cannon to blast the building. Its a challenge of your family vs another, it made it competitive and fun. We were laughing so much and giving it our all to beat the other families. We also LOVE the characters that walked around. We met Benny from Lego Movie, Kai from Ninjago and Lance from Nexo Knights. Another aspect of the park that we found fun was the Lego Mini Figure Trading. You can trade a mini figure that you have with any Legoland staff member. They have them displayed on name badges, near food stations and stores. When we first arrived at the park we asked a worker named Steve about the trading figures and where can we get one. He pulled out of his top pocket a Lego guy mini figure and gave it to my son, then said Happy Birthday. So nice of him! The hotel gave my son a Happy Birthday pin and First Time Visit pin and anytime a worker saw his pin they told him Happy Birthday, he loved the attention and birthday wishes. I would liked to have seen more Lego themed Live Shows. We did watch all the 4D shows which were cool but I do love a live character show. 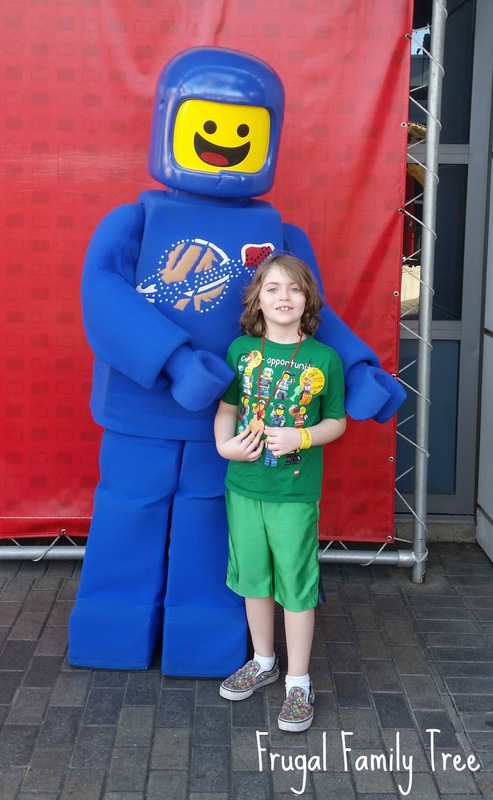 It has been a few years since the Lego Movie has come out so there was not as much Wildstyle or Emmett as I thought there would be, but we did get to meet Benny the Astronaut character. I will admit we turned on the song "Everything is Awesome" a few times on my phone so we could dance to it as we went through the park. Miniland, USA was an amazing display to see! We spent over an hour looking at the displays of cities and my son even was able to drive a Lego tug boat in the water. We saw mini Las Vegas ( we have family there so it was a cool thing to see) there was New York, San Francisco, Washington D.C., Hollywood and so much more. The Star Wars displays were my son's favorite. He wanted his picture with all the cool stuff he saw. We even saw his favorite President, Lincoln. 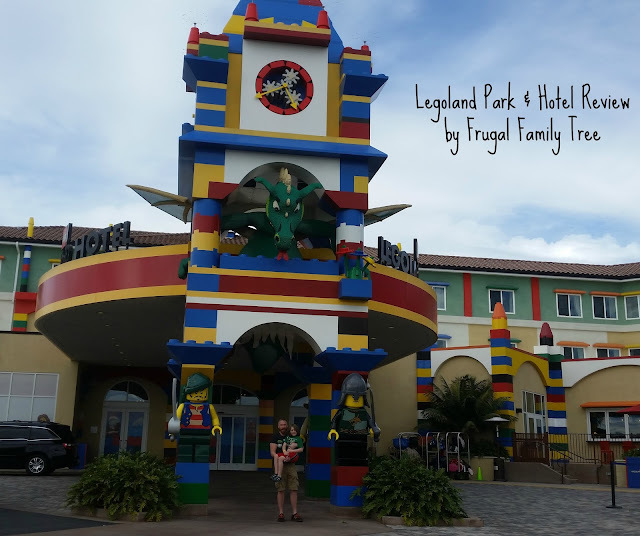 We stayed in the Legoland Hotel and I will say its worth the money! It really made a huge difference in our experience. We were given early access to the park with the cool Lego yellow bracelets we were given as hotel guest. 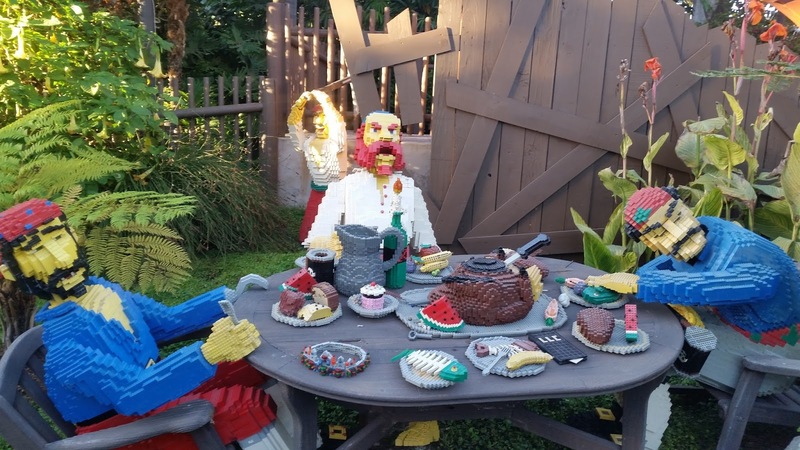 During the Fall the park closes early, staying at the Legoland Hotel extended the Lego infused fun. The hotel has a giant castle made out of Legos where the kids can play and build Legos in the Lego pits. There is even a Lego playing area in the lobby where you check in at. The elevator is the coolest elevator I have ever been in! My son squealed with joy and started dancing when the disco ball lit up and the music started playing as we made our way to the 3rd floor. 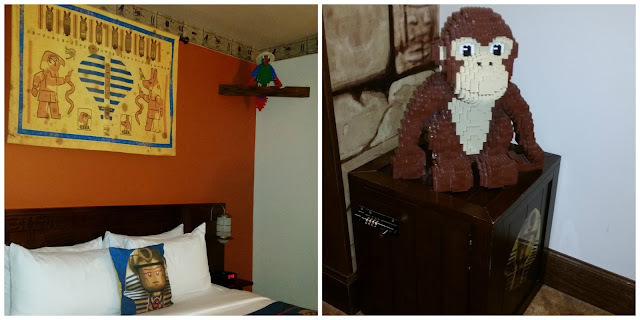 We stayed in an Adventure themed room that had bunk beds, a treasure chest, a view of the pool and filled with many cool Lego builds like a scorpion, a monkey and a parrot. My son's birthday happen to be on a night that the Legoland Hotel was having a Disco Party for the kids. When we arrived my son asked me if they were having the dance party for his birthday, I told him they most certainly are, go have fun! It was so cute to see him dancing his heart out including his cool break dancing moves. I even joined him on the dance floor showing off my embarrassing Mom moves! I will say I did throw in the "sprinkler", some "robot" and a tad bit of square dancing moves. We had such a fun time. Seeing him smiling as he danced around with the disco lights flashing, beams of colored lights all around him made me realize how precious moments like these are. That the time and money spent on our annual birthday adventures are so worth the cost to make memories this awesome. The room had a locked treasure chest in it with a list of clues to find the code for the lock. We loved doing this as a family. You make your way around the hotel using clues to find numeric answers for the code to the lock. 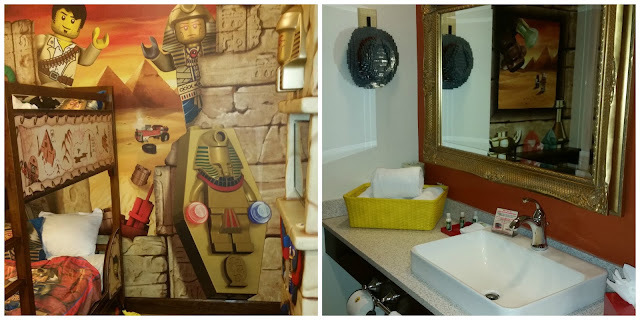 I suggest doing this treasure hunt since it will be fun for your kids to explore the hotel and there is a very special prize inside for your child. 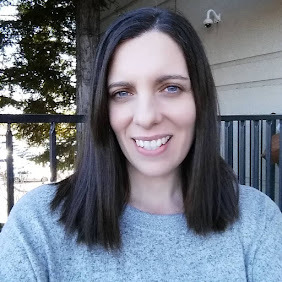 We sat outside by the firepit near the pool for a while just enjoying the crisp Fall air and my coffee. My son loved the complimentary apple juice pouches in the room too. After coffee we went to Skyline Cafe to enjoy some cake and sing Happy Birthday to my son. The receptionist at the restaurant named Kaylee was so nice and when I asked her if I could buy a cupcake or slice of cake she said it was free and for us to pick a spot to sit and she would be right out. 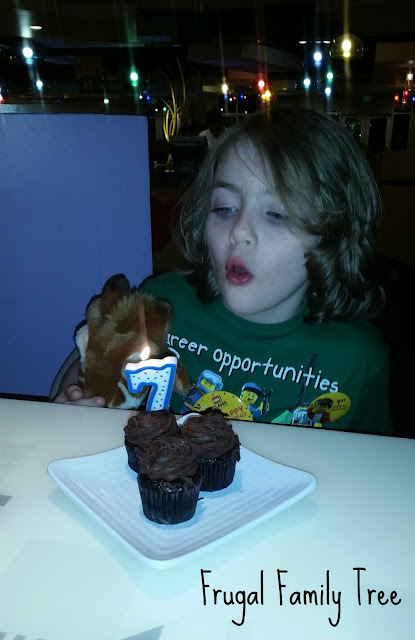 She was so sweet, she put the number seven candle I brought with me and the waiters and her all sang Happy Birthday to my son. She even re-lit the candle after my son blew it out when they started singing. 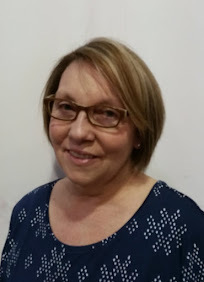 She went above and beyond for us and made it so special. A few of the things I loved about the hotel was the bunk beds for the kids. It was so cool and made it feel like a true Adventure room. My son requested that my husband sleep on the bottom bunk, cutest thing ever to see them sleeping in the bunk beds when I woke up that morning for the Free breakfast buffet at Bricks Restaurant. Each night you stay at the hotel you get free breakfast buffet at the Bricks. 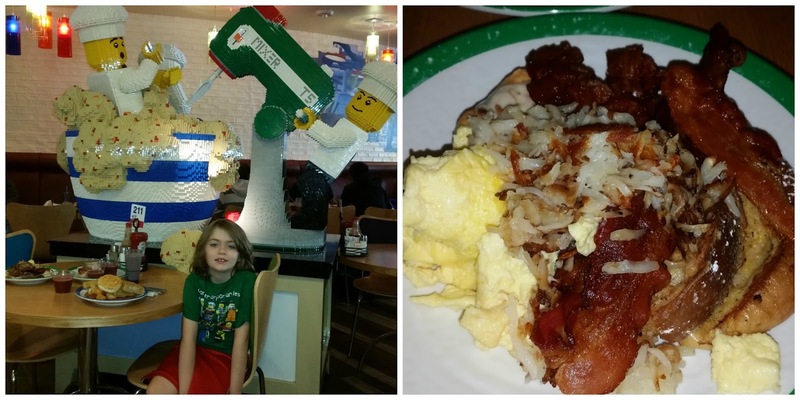 It is a delicious variety of breakfast items, coffee and even a kids buffet area with huge waffles and fruit. We had fruit smoothies too! One of the Nexo Knight gals that was at the disco party was also at the breakfast buffet. She came over to talk to my son and he told her he remembered her from his dance party the night before. She was super nice to him as were all the Legoland park and hotel employees. There was so much to do at the park and hotel that we did not get to it all! I recommend a 2 night stay and the 2 day park hopper passes. We had so much to do at Legoland we did not make it to the Sea Life Aquarium. For our next trip there we will stay more days so we can swim in the pool and see the aquarium. I definitely recommend Legoland and the Legoland Hotel for family vacations! We had an awesome time and made priceless memories that we will treasure forever. 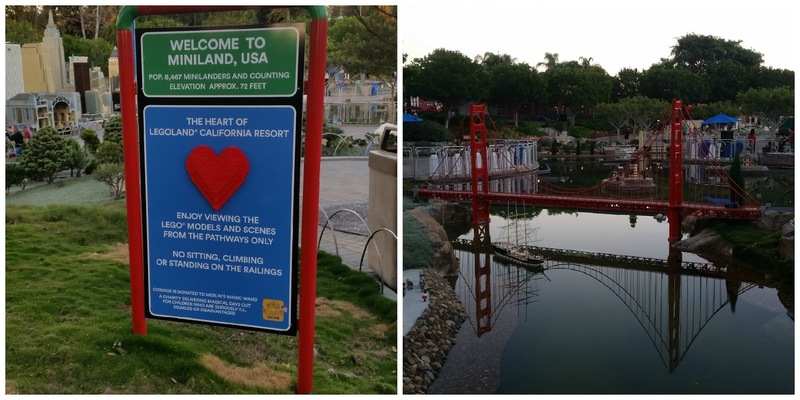 I have so many more amazing pictures of Miniland, the rides, the food and hotel, too many to share all in one post. It fills me with joy to look back at the pictures and relive our awesome trip.